Your No.1 Real Estate Resource! 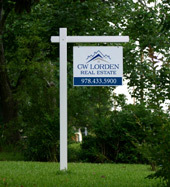 With over 30 years experience in the area, CW Lorden Real Estate is an active member in all aspects of the real estate field. We specialize in working with both Buyers and Sellers in Residential Real Estate, Single Family, Multi Family Properties, Condominiums, Commercial and New Construction. We offer Full Relocation Services, First-Time Home Buyers Programs, New Construction, Antique, Rental Property Management and Senior Real Estate Housing.